When you think of animals you don't want to aggravate, crocodiles are probably pretty high on your list, and for good reason. Crocodiles boast the most powerful confirmed bites of extant creatures on the planet. Play it safe and always stay far away from any crocodiles you might encounter in the wild. They often reside close to wetlands. Massive saltwater crocodiles (Crocodylus porosus) are no jokes when it comes to jaw power. Their bite force has been confirmed at 3,700 pounds per square inch. You might think of tigers and lions as being equally formidable predators, but their bite forces are significantly less impressive -- think roughly 1,000 psi. Bite force in humans usually tops out at about 200 psi. Saltwater crocodiles not only have the most powerful bites in the crocodile world, they're also the biggest of them all. In comparison, American alligators (Alligator mississippiensis) have a bite force of 2,980 psi -- still less than saltwater crocs. In 2008, great white sharks (Carcharodon carcharias) were guessed -- via computer representation -- to have a bite force of close to 4,000 psi. If that could be verified, great whites would beat crocodiles out in that department. However, measurements of great white sharks' bites have not yet been conducted on actual specimens, so crocodiles still have the fiercest confirmed bites around. Ambushing hunting is the name of the game for crocodiles. When crocodiles are on the lookout for food, they lurk patiently until their desired prey approaches. When their unsuspecting targets are in front of them, they swiftly thrust themselves into them and seize them with their intimidating jaws. The muscles that are responsible for shutting these reptiles' jaws are significantly tougher than those that are in charge of opening them. Since crocodiles are incapable of chewing, everything they consume goes down fully intact. If a crocodile can get something inside of his mouth, he'll consume it, whether birds, fish, fellow crocodiles, buffalo, pigs, deer, monkeys, frogs or turtles. Although you might not like to think about it, crocodiles occasionally feed on people, too. 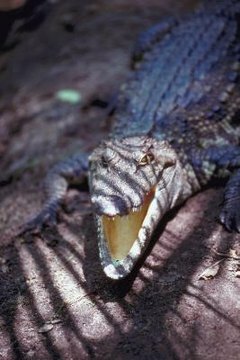 Nile crocodiles (Crocodylus niloticus) and the aforementioned saltwater crocodiles are the biggest hazards in the crocodile realm. They bring upon the deaths of many human beings in areas of Africa and southeastern Asia annually. Refrain from ever going near crocodiles, no matter the species. Their bites can be ferocious. ReptileChannel.com: How Hard Can Crocodiles Bite? Does an Alligator Have a Stronger Bite Than a Croc?